Do what works. Stop doing what doesn't work. Have you tried Periscope? It’s another social media app — this one broadcasts live video, which can also be archived at Katch.Me. I’ve given it a couple of tries today. First I “Periscoped” an overview of Engaged Homeschooling philosophy, but that was not such a successful broadcast because I was apparently too far from the router, causing sync problems with audio and video. Once someone suggested this may have been the problem, I tried Periscoping from a different room in the house to see if I got better results. That second Periscope broadcast did work out better technically (though really, quality has a lot of room for development, even though the whole concept is something broadcasters couldn’t have dreamed of back in the day) — and it gave me a chance to explain a little more about the Virginia Homeschool High School Symposium. If you’d like to hear what the Symposium is all about — or you’d like to get a glimpse of how Periscope works for a new user, watch my video on the Virginia Homeschool High School Symposium. This entry was posted in Conferences and Workshops and tagged homeschool teen event, interdisciplinary homeschooling, Periscope, Virginia homeschool activity, Virginia Homeschool High School Symposium, youth homeschoolers on October 28, 2015 by Jeanne Faulconer. I’m excited to share a symposium for homeschooled teens that I’ve been working on conceptually for a long time. Teens (14 and up – “high school age”) will come together November 4 for an advanced “show and tell” where they’ll share their projects and passions across all fields of interest. The aim is to create a social and academic peer experience for teen homeschoolers and recent grads. UPDATE: The Symposium has filled with homeschooled teens from around the state, and registration is now closed. If you would like to be placed on the waiting list in case of a cancellation, please scroll down to the bottom of this post. Looking forward to seeing all the great kids at the Symposium! The event will be held beginning at 12 Noon, Wednesday, November 4, at Passion Academy (3921 Deep Rock Road, Henrico, VA — this is on the northwest side of Richmond). Students will gather to present, demonstrate, display, read, or perform their work and participate in discussion about its implication, craft, and connection to the theme – POWER. Works are welcome from any area which can touch on the implications of any aspect of “Power” – including the arts, history, social science, technology, engineering, media, geography, science, math, politics, sports, writing, current events, or other areas. Don’t let the theme throw you – power exists in many forms, and your presentation, reading, performance, artwork, model, or display may be about power or may depict power or may explain power or may demonstrate power or may show your personal power. Think of all the possibilities – solar power, wind power, the power of music, political power, the power of athletes, the physical power it takes to dance, the power of photography, a paper about the power of Martin Luther King (the power of nonviolence) or – simply – the power of an animation or video you create or a dramatic scene you enact. There are power plants, powerful poems and songs you’ve written, and power chords. We have horse power, water power, brain power, and fire power. And there’s always the question, what’s your super power? If you’ve got a passion, you can fit the theme of power into or around it. Students are welcome to adapt existing projects they have created previously or use material they are currently working on for a class or current study, or they can develop something new for this gathering. Jeanne is available by email to dialogue with students and parents about their work or about the theme. Basically — to the students I say this: come sing for us, tell us about your favorite novel, read us your story, show us your scientific research, demonstrate your tech project (robotics? animation? app? code? hardware? ), present your ideas on history or politics, play your instrument, do your stand-up, show us your photos and artwork, make us the perfect smoothie, read us your poetry or short story, tell us about your passion (does not have to be academic) – and so on – and see what other teens are working on. It’s all about what you are engaged in. Each student will have up to fifteen minutes for presentation followed by up to fifteen minutes of facilitated discussion, review, and guided appreciation. Students are asked to participate in the discussions (but no one will be badgered). A maximum of twelve participants — ages 14 and over — will be accepted to the symposium. A minimum of six participants will need to be registered to hold the symposium. Participants will be expected to be open to a wide variety of viewpoints, similar to discussion, presentations, and performances that might occur in a college seminar. I’ll be leading the facilitated discussion myself. For those who have been in my writing workshops, co-op classes, or conference workshops — the feel will be similar, with respect and support for kids who “are where they are” with their interests and their comfort in sharing their work. We’ll make it relaxed and fun. I’ll be glad to correspond with teens about their work prior to the Symposium, to give them ideas and support. And yes, if this idea sticks, I’ll expand it — adding capacity for more teens and also adding similar programs for middle schoolers and late elementary-age kids. Basically, I just want kids to have even more exposure to what their homeschooled colleagues are doing, venturing beyond their usual co-ops, classes, and communities to share the cool things they’re doing and learning. If you have any questions, use the contact form below, and I’ll get back to you within a day or so. Pilot program discount registration $30 (available for 11/4/2015 event only; prices will vary for future events). Ask about sibling discounts. (All participants must be age 14 or over). UPDATE: The Symposium has now met the maximum number of registrants. 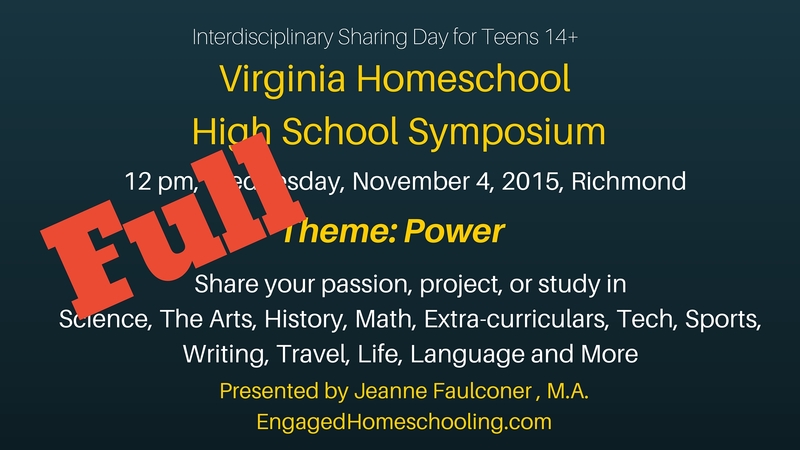 This entry was posted in Conferences and Workshops, Engaged learning and tagged Homeschooled Teens, homeschooling teens, interdisciplinary learning for teens, interest-driven learning, passion-driven learning, self-directed teens, Virginia activities for homeschooled teens, Virginia Homeschool High School Symposium on October 6, 2015 by Jeanne Faulconer.